The Harry Caray statue at Wrigley Field is located at the corner of Sheffield and Addison right near the entrance of the bleacher's. A fitting place for Harry's statue as he would occassionally call a game from the bleacher's at Wrigley. Harry was always known as being a fan favorite and now everyone that enter's the bleacher's for a Cubs game can remember Harry!! It was once at the corner of Sheffield and Addison (the unveiling being held on August 12, 1999) before being moved to make room for Billy William's statue. The rededication was held on September 1, 2010. Here is a good clip of the ceremony. Holy Cow, Cubs Trivia Many people know that Harry also annnounced games for the St. Louis Cardinals and the Chicago White Sox (we forgive you, Harry), but most would not know that he also announced for one year with another team. Do you know which team this is? Apparantely, the owner wanted him to change his famous "Holy Cow" to "Holy Mule". What was he thinking? Scroll down to the bottom of the page for the answer. Harry Caray Statue Vandalized A few incidents over the years with Harry's statue being defaced. Here is an article that documents a few other incidents. Harry Caray announced for the Oakland Athletics for just one year in 1970. 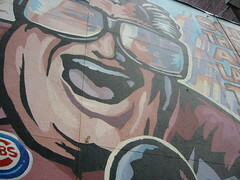 Love this Harry Caray photo of a mural outside of Harry Caray's restaurant in Chicago.